This Sunday The New England Patriots are playing in their 8th Conference Championship in the Bill Belichick era. During this fourteen year span, The Patriots and their legendary head coach have not had a losing season and won an NFL-best 163 regular season games, 3 Super Bowls, 5 AFC Conference Championships, 11 AFC East Division Championships. These numbers are especially impressive since the NFL is designed for parity in the salary-cap era. I’m sure you’re asking yourself, how are The Patriots able to maintain excellence over a long period of time while other teams slide up and down the standings? The answer lies in how Bill Belichick recruits, motivates, and compensates his coaches and players. And I strongly believe that startup founders can take away some important lessons by studying how The Patriots handle HR and personnel decisions. Team First: No single player is bigger than the team. 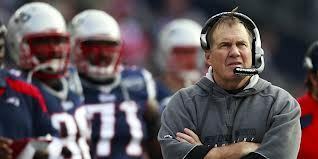 Many players have been cut by Belichick for detrimental behavior that undermines the concept of team. Promote Within: coaches often come in as scouting assistants and then move up and around the organization as they progress in their careers. Additionally, if a player performs they can go from third string to starter. Focus on Excellence: every player has a specific job in the system and they need to perform at a high level consistently. Fiscal Discipline: The Patriots are notorious for not overpaying "big name players” and making hard financial decisions such as releasing a “fan favorite” when they no longer perform relative to pay. Depth: The bottom third of the Patriots roster is littered with veterans and high potential “no name” players that fit into the system. Every single player has a specific role on the team. Skill Development: Throughout the season, the coaching staff not only focuses on the upcoming opponent but also how each player can improve their skills. Situational Preparation: Belichick and his staff simulate game conditions and teach “situational football” using both conventional and unconventional methods. Love him or hate him, there’s no question Belichick has built one of the most successful programs in the history of professional sports. Next time you’re thinking about how to build a winning organization, I strongly recommend taking a page from Bill Bilichick and The New England Patriots. The numbers don’t lie.